Veg Chowmein Indian style is one of the most popular street foods in India. Be it a big metro or small quiant village you will find "chowmein thela wala" every where. and its an all season delight. For some it has now become a comfort food. Vegetable Chowmein is very different and delicious from any other noodle forms that you are aware of. 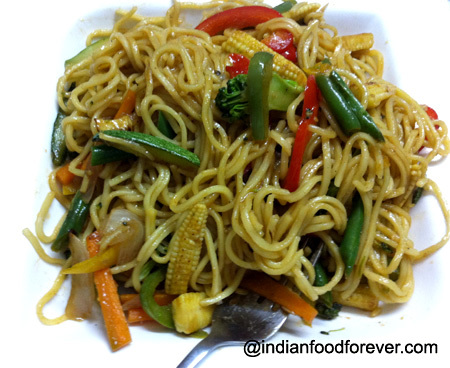 Here is a easy recipe of vegetable chowmein Indian style. Boil Noodles in enough water with salt and 1 tblsp of oil to avoid sticking. Take care do not overcook. Strain Noodles in cold water 2-3 times and drain water and set aside . important thing to remember is to cookon high flame constantly. This gives the noodles a burnt smoky taste that you get from the street side shops. Heat oil in a wok/kadhai and add sliced onions and stir fry for 20-30 seconds. Now add all other vegetables and stir fry for 2 minutes. Add salt and black pepper and mix well. Now add boiled noodles and mix well (take care that noodles don't break) . Add vinegar, green chili sauce, ketchup and soya sauce and stir fry for a minute on High flame. Serve the vegetable chowmein hot. Note : According to taste vinegar, soya sauce and chili sauce can be increased or decreased.